Oh Kitty your Cissy is such a delight! I adore your sweet plaid pumpkins and will have to make a batch of the popcrn snack mix for my family. Have a wonderful fall day. That little Cissy is so adorable and she obviously loves playing with her Grandmother Kitty! 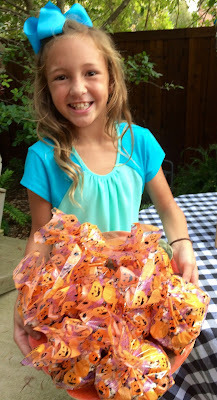 Your fabric pumpkins are really cute, and the popcorn snack mix sounds very tempting! Happy Birthday to your daughter, what a beautiful family! YUM! I can not wait to make the snack mix. 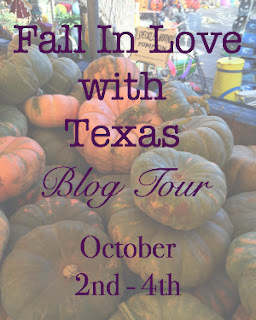 You have a beautiful family and a beautiful blog fall tour. Cissy is precious! That looks amazing. Thanks for sharing at our tour. I will have to try this recipe. So fun. Your Pumpkins are just adorable and what a great idea. I just love your kitchen helper and what a great Popcorn snack to enjoy for a nice fall day. Thanks so much for sharing you great fall ideas and your wonderful talent! Cissy is such a sweetheart. You must have had a fun day together. 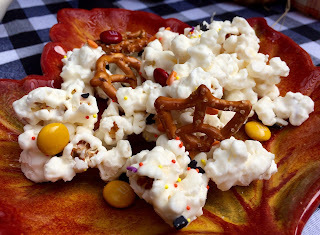 The snack mix looks delicious and I hope to try it this coming weekend for our Canadian Thanksgiving. It would make a fun treat for the grands to take home with them. This snack mix sounds amazing! Thank you for sharing it! What a yummy snack! You always have such great ideas!! Another yummy snack and Happy Birthday to Molly! How wonderful to spend so much time with your little granddaughter! I wish my son would get transferred back here so I could spend lots of time with my Jenna-Lynn. I know you and Cissy are making lots of memories. Bless your hearts! Have a beautiful week, dear Kitty. Kitty, the popcorn snack mix looks yummy. I'm going to make some to have on hand. Great idea. Hope you are enjoying this beautiful TX fall. I switched my day to Wednesday. Will you move my link from Monday to Wednesday so people don't stop by thinking I have my fall tour today. Thanks! Beautiful post,Kitty!Your family is a great treasure,so precious...God bless you! Thanks for the delicious treat! What a fun snack for this time of year. I can hardly wait to make this! It sounds so yummy. And the decorations look so fun and festive. Happy Fall! Your Cissy is so adorable, I want to kiss her...so is Molly and her family. Happy belated birthday to your daughter. I love popcorn, and would have wanted one of the children's bags. :) What a special time for you and your granddaughter making preparations for your daughter's birthday party. These are things Cissy will remember for a lifetime. Hi Kitty, What fun this post is and I love the popcorn treat sweet Cissy made. She is so talented and her smile always lights up the page. 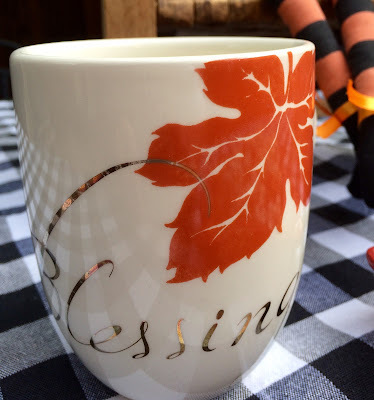 Love the darling pumpkins you designed and the blessing cup is so pretty. Your daughter and family are beautiful and what a wonderful photo of them. Thank you for sharing this special treat recipe. I will certainly have to try it. Kitty, Cissy is getting to be quite the little cook - thanks to your Cooking Camp! Your fall décor items are so charming. Your home always looks so warm and welcoming. The popcorn snack mix looks delicious! Your family photos are so cute! Your decorations always look so lovely. The plaid pumpkins are too cute! I love popcorn, so this sweet and salty mix is just up my alley. I'll definitely grab a bag...or two! Sending my love to the great state of Texas, especially the Houston area. Wonderful tribute post! Happy Birthday to your daughter, too! I'm behind with my blog reading but finally made it to catch up on your news and see more of your darling granddaughter. The popcorn looks very inviting. Love the picture of your daughter's family. 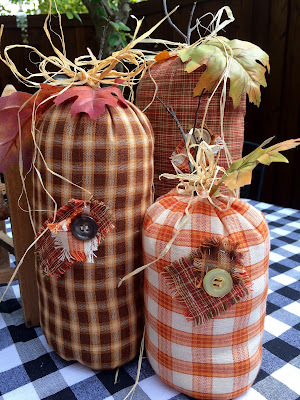 What yummy fall treats and how attractive your fall vignette is on your patio! I'm behind as usual on commenting. There's nothing more pleasing to the pallet (at least for me) than a sweet/salty snack...YUMMY! Kitty, I love that you have such a loving family. They're all beautiful. Wishing your daughter a very special year to come! And a big thank you to Cissy for putting the party together. It all looks so good! I love the popcorn recipe, it reads as if it would be hard to stop eating once you start! you are busy with blog parties. good for you! like your handmade pumpkins and Cissy is just too cute. looks like she is a great helper and hostess!Thanks for the recipe. Happy Tea Day, Blog Party! What a fun thing for Cissy to help with! Happy birthday to your lovely daughter! I am definitely in love with Texas - one sister lives in San Antonio! I definitely need a trip there. Hi, Kitty! Your Cissy is the best helper. 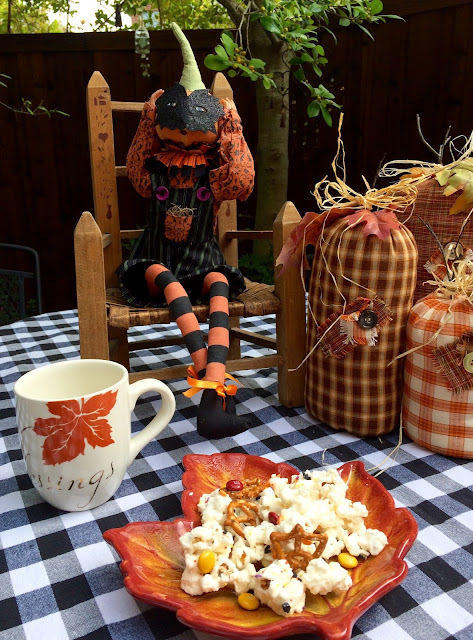 The popcorn looks delish, and I love the little patches on the pumpkins! Great to visit you again. 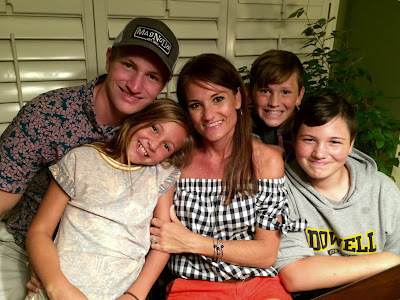 Now that I'm officially an empty nester I'm able to blog more! Molly LOOKS like one of the kids, Kitty! She gets her youthful good looks from her Momma and grandma for sure! Beautiful!!! OK. Popcorn and old maids? You crazy Texans confuse this Yank. Please explain - I assume it means unpopped kernels? I have never heard the term. I need to make that snack - it sounds so tasty - I love sweet and salty together. YUMMMMMMMMMMMMMMMMMMMMM. Hi Kitty, oh I just love your fabric pumpkins you made. 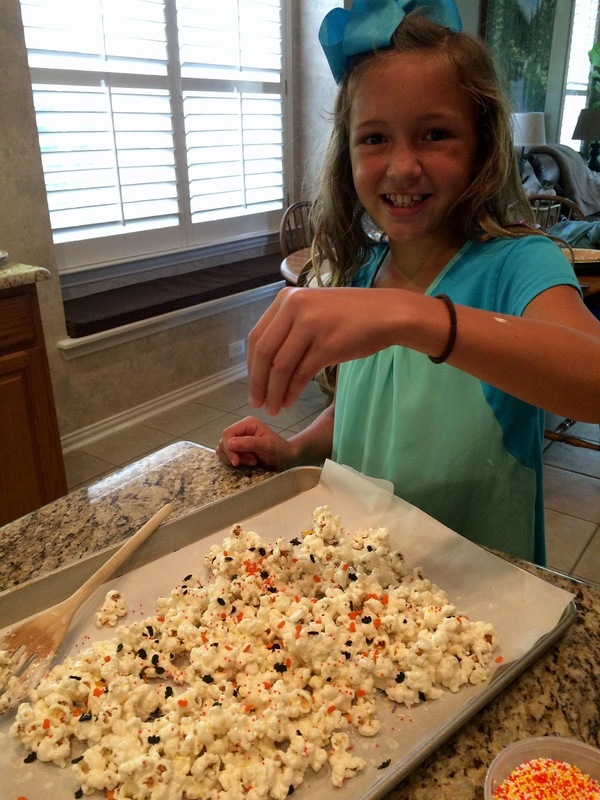 How fun to make this snack mix with your granddaughter. Thanks for sharing this recipe at C&C with J&J. Kitty, you are so talented. Loving the sweet pumpkins. Your family is lovely. Loving how Cissy gets in the kitchen and cooks. The popcorn mix looks and sounds great. Who doesn't love a great snack. Your daughter looks like you, and I see where Cissy gets her good looks! She's a real cutie, and I know her company brings you lots of pleasure. She looks like she has a sweet disposition. The fabric pumpkins you made are just darling, and I like your "Blessings" mug. The popcorn snack mix sure does look good, my friend. :D Thank you for sharing another good recipe with us, and I hope you have a great week! Your daughter is a beautiful lady and she has a beautiful family! This sounds like a delicious, fun, fall recipe. What a nice family you have. I bet everyone enjoyed those goodie bags. So glad you brought this awesome post to share with us today! Hope you have a great weekend and thanks so much for sharing your post with us at Full Plate Thursday! Hi Kitty...I love your fall post! The popcorn mix sounds so good! I love the fabric pumpkins and the mug. perfect! Oh how delicious Kitty - that mix is a new one to me and I would love to try it - very original. I thank you for linking to last's week's party and apologize for commenting so late here. I love those very fun pumpkins and decor.